Previous Question about Weekly Photo Challenge???? Looks warm and cozy in that heirloom bed. 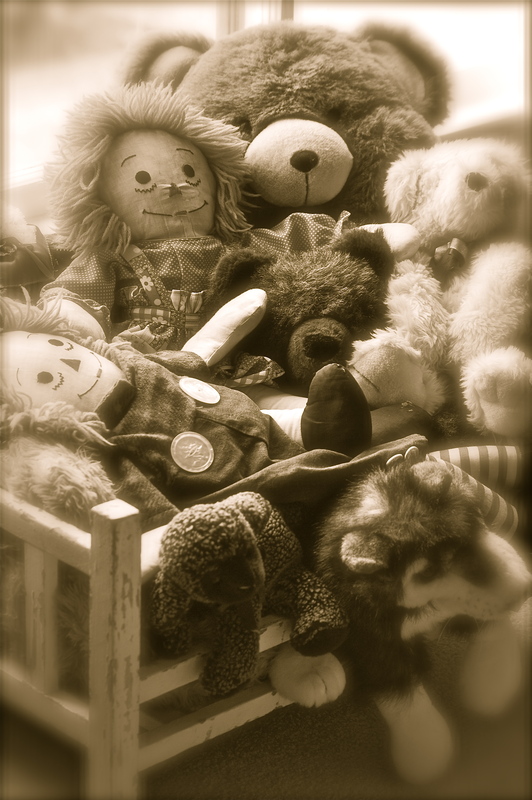 I’m glad you still have the bed and the stuffed animals gathered through the years, lots of beautiful memories of your childhood. Thanks for stopping by, Barb. Yes, I do have beautiful memories of childhood. I, too, am glad I kept the bed. I often think of Granddaddy when I see it. I can identify with these sweet memories. how delightful. i like the sepia finishing for this as well. nice to see you blogging again, sharing your beautiful clicks. welcome back! I can identify with this. I still have my Raggedy Ann and chair from 72 years ago. My mom made her and my dad the chair. Great Memories. I, too, like the sepia tone. I started the photo challenge. I am not good at keeping up with challenges. Life happens. Thank you for stopping by, Linda. It is nice to see you again. And glad you like the post. Don’t know how well I will keep up with the challenge, but will do my best. After all, my job takes priority. But it is good to dabble in blogging again.